Secure and protect your connections with a wire strain relief connector. These connectors are designed to secure a power supply cord to a piece of electrical equipment. With a liquid-tight seal, the wire strain relief connector securely protects the connected end of the wire. The flexible coil design of the wire strain relief connector greatly reduces wire stress at the connection point, to keep your connection healthy and lasting. This flexible body also helps prevent any cable kinking that could compromise your connection. Manufactured with nylon and a TPE gland seal, the wire strain relief connector protects from dust, salt, water, weak acids, alcohol, gas, minerals, and other oils. Easily create a secure, flexible, and long lasting connection with a wire strain relief cord connector from Del City. Internationally approved: UL #E51579, CSA #93876C, IP 68. Liquid tight, optimum seal connector with vibration proof protection (up to 70 psi). Resistant to salt water, weak alkalis, alcohol, gasoline, grease, and common solvents. Working Temperature: -4° F(-20°C) to 212°F (100°C). Power cord strain relief connectors have a STD NPT thread and is designed to secure a power supply cord to a piece of electrical equipment. This power cord strain relief connector provides a liquid-tight seal on the power cord entry and reduces wire stress at connection point. Liquid tight strain relief cord connectors feature vibration proof protection (up to 70 psi) and an optimum seal. Dust protection and resistant to salt water, weak alkalis, alcohol, gasoline, grease, and common solvents. Standard dome nut for strain relief only. 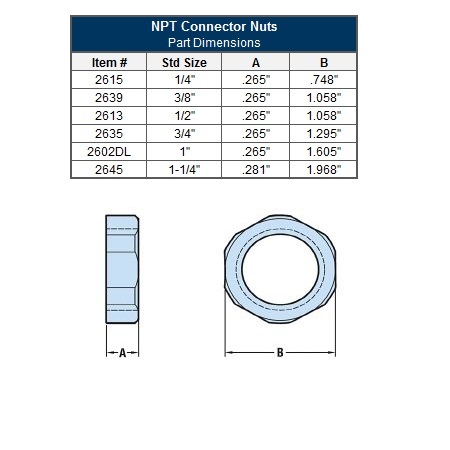 This NPT strain relief cord connector nut is required for use on STD NPT strain relief cord connectors. This locking nut completes the connection of a STD NPT cord connector to a power cord, providing a liquid-tight seal that prevents moisture or any other damaging liquid from ruining the power cord connection. 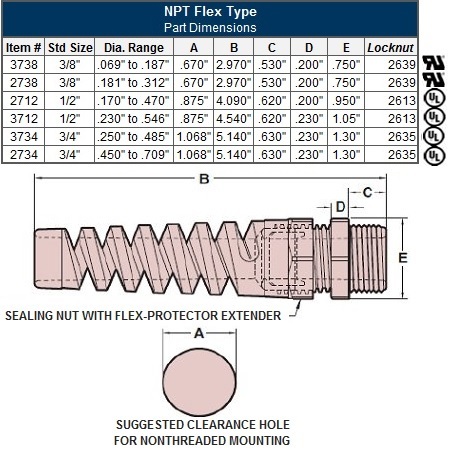 NPT nut required for use on Std NPT Thread Strain Relief Cord Connector. Working Temperature: -22° F(-30°C) to 221°F (105°C). The flexible strain relief cord connector is unique because it features a partially flexible body that helps prevent cable kinking and sharp bends which extends cable life. It is recommended to use the cordgrip with the smallest maximum diameter that will fit your application. Flamability Rating: 94V-2. Resistant to salt water, weak acids, alcohol, gasoline, oil, grease, and common solvents. 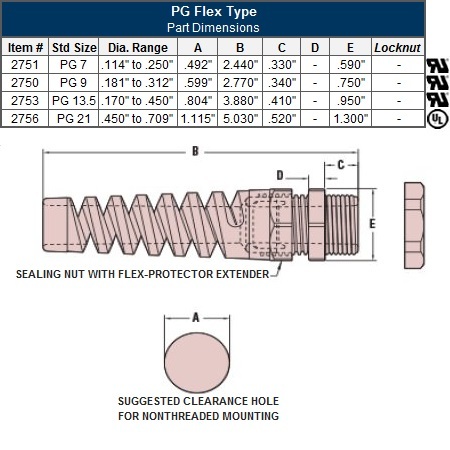 PG hub threads are steel conduit threads per DIN 40430. These power cord strain relief connectors have a STD PG thread and is designed to secure a power supply cord to a piece of electrical equipment. The STD PG thread cable strain relief provides a liquid-tight seal on the power cord entry and reduces wire stress at connection point. 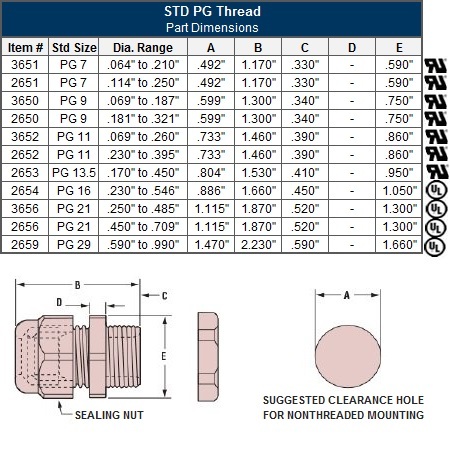 Std PG Thread 6/6 Nylon w/ TPE gland. UL listed under #E-51579, CSA #LR-93876. Nylon 6/6 sealing washers will provide a liquid tight, dust tight, and oil tight seal at the enclosure. Washers are ideal for wet locations that require a separate gasket between the box and fitting. 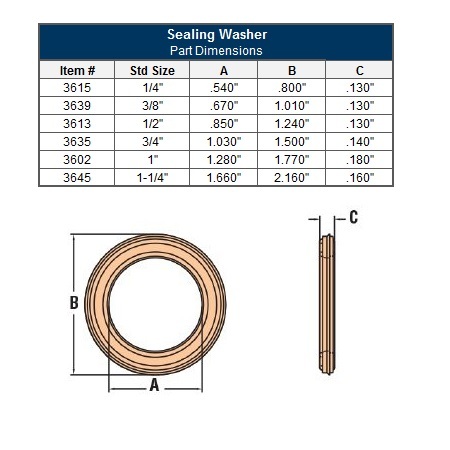 The washer will aso make your connector suitable for several other panel sealing applications. The washer is easy to install, and it has special double sealing ridges to compensate for minor unevenness at the enclosure. Flammability Rating: 94V-2.